Spherification is tricky, not just because of the chemistry involved, but because the technique has become associated with the most farcical extremes of modernist cooking. However, when used with purpose and not simply ‘cause, spherification can still provide an element of surprise and delight to your cooking. Tomorrow, I’m going to cook salmon (sous vide, if you’ve been playing along at home) with mascarpone and greens, an homage to the salmon crostini at Spur. I wanted to top the fish with a spoonful of salmon roe for added saltiness and for their funny, squirm-inducing texture. Unfortunately, roe is expensive. 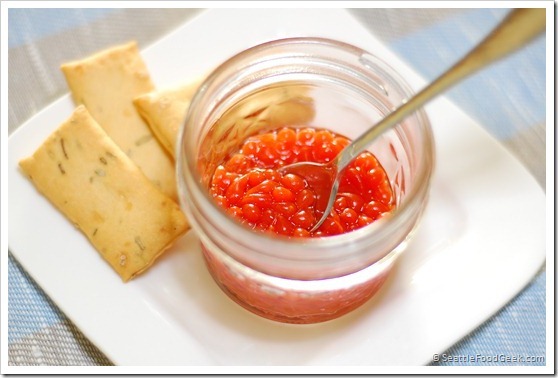 So, I came up with a substitute: spherified hot sauce that looks like salmon roe.